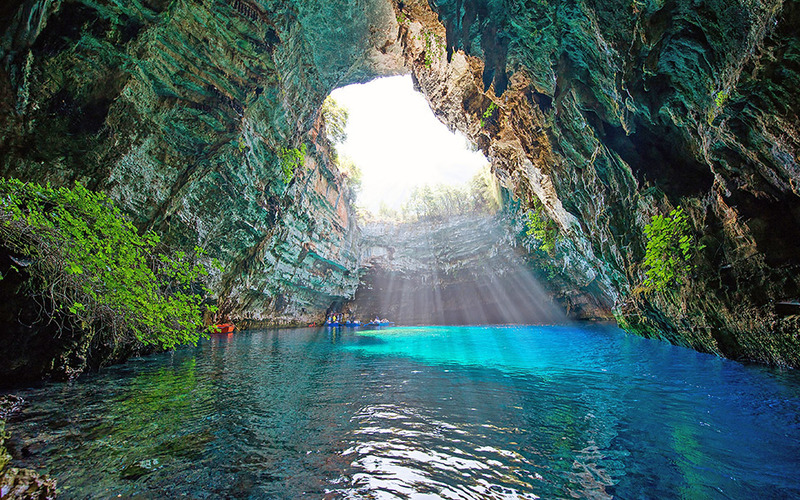 Greece has a plethora of natural wonders, and the country’s famous blue caves are no exception. These are the best places where sun, sea and earth combine to create a wondrous spectacle – which is also very photogenic. The legend behind this huge cave says that it was named after a heartbroken nymph, Melissani, who took her own life when spurned by the god Pan. It lies 2 km outside Sami, and regularly features on lists of the most beautiful natural attractions in the world. To reach the lake, visitors descend through an underground passage; it is after this that the fun really begins. A boat ride takes you to the center of the cave, which was originally composed of two chambers. The roof collapsed thousands of years ago following an earthquake, creating a natural window through which sunlight floods in and paints the waters with an array of blue tones. It’s a miraculous sight – made even more magical by the tranquility of gliding across the lake in the little oar-powered boats. No sounds of engines to disturb your peace here; it’s just you and the splash of oars against water. The cave itself was discovered in 1951 and its stunning stalactites have been estimated to date back to over 20,000 years. At the center of the lake a little island emerges, where evidence of worship of the god Pan was uncovered in previous decades. What sets this (lake) cave apart from sea caves is that it benefits from a contrast: there is the crystal blue water below, and lush greenery growing at its summit, which is a breathtaking, visual delight. Visit between 11 am – 1pm for the full effect of the light playing on water. The road to the cave is overland, so it can be easily done with a car, scooter, or organized coach trips offered by hotels and tour operators. A 10-minute trip across the lake by boat costs €7 ‒ try to get a singing boatman who will copiously demonstrate the cave’s acoustics! Prices given are indicative. Lefkada is famous for its turquoise waters and its white sandy beaches, which get their color thanks to the island’s abundance in limestone. These limestone rocks in turn have given way to many caves dotting the island’s shores. 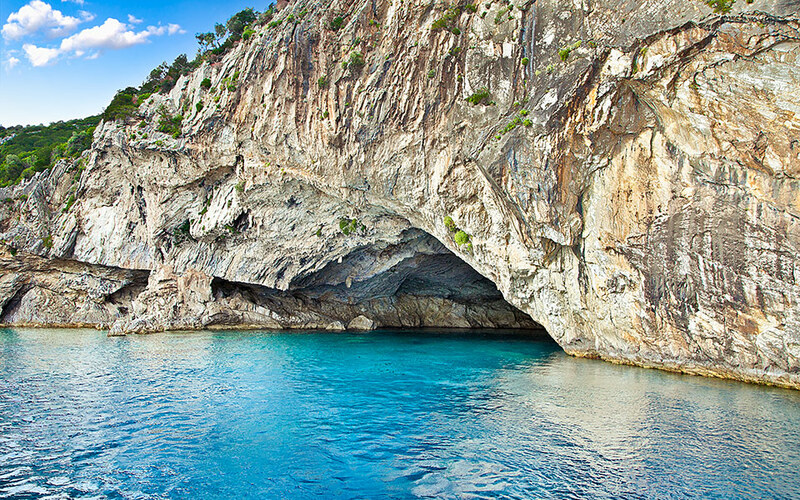 The little island of Meganisi, located just 12 nautical miles to the east of Lefkada, is home to Papanikolis cave. This beautiful cave takes its name from a submarine that was hidden there during World War II. The cave provided shelter to boats of all sizes during bad weather, as well as to locals hiding from pirates and other marauders. Today, it’s simply a beautiful place to visit. Its sheer size is impressive. 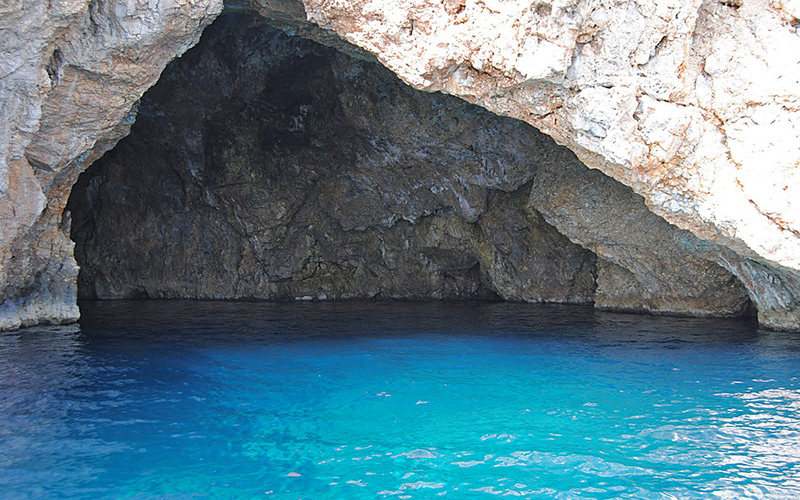 It is the second largest sea cave in Greece, and it measures 120 meters in length and 60 meters in width. Inside, you’ll be treated to the dazzling sight of sunlight dancing and bouncing off the crystal clear waters, which cast their mesmerizing blues all over the cave walls and stalactites. For those unable to resist plunging into the waters: you’ll be rewarded for braving the cold by a rest on the little sandy beach at the far end of the cave. Several cruise companies operate along Nydri’s port, offering day cruises to the caves. Getting there takes around 45 minutes. Expect to pay around €20 per person. Prices given are indicative. The blue cave of Kastellorizo is the island’s most famous attractions, and undisputedly one of the most stunning blue caves in Greece. The inside is 75 meters long, 40 meters wide and 35 meters high, but from the outside you almost can’t see it at all. Reaching it is a little tricky ‒ the entrance is a meter or so high, so you need a small boat, calm seas and steady nerves. But it’s worth it. Inside, the sunlight is refracted through the water, scattering the light and turning the sea into a pool of vibrant turquoise blue so beautiful that visitors have described it as overwhelming. The best time to visit is in the morning, when the sun is low and the full glory of its interaction with the water can be appreciated. 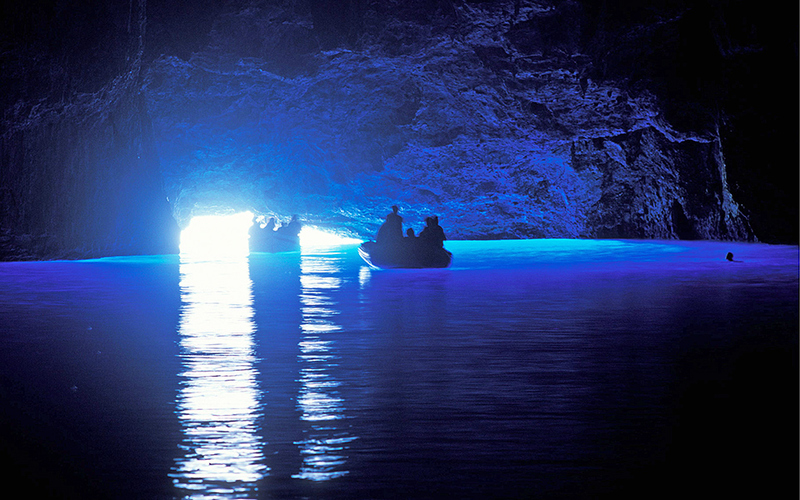 It’s no wonder that Tripadvisor lists a visit to the Blue Grotto as the number one thing to do on the island. Accessible by a 40-minute boat ride, it costs around €20 per person. Operators advertise themselves at the island’s port. Prices given are indicative. One of the best-known sights of the island, located in the north, these are not caves in the strict sense of the term, but rather the remnants of caves worn away by the water, leaving behind natural limestone formations. It was discovered in 1897 by Antonio Komouto, and since then visitors have been flocking to see it. The highlight of any visit is when the captain gently guides the boat right through the white arches, pausing to allow visitors to appreciate not just the blue waters, but the way they taint the limestone in their colors, painting everything around them in a stunning, ethereal blue (including you!). To get the full effect, visit between morning and noon. Accessible by boat from Aghios Nikolas Port. Trips cost around €15 per person and usually include a trip to Navagio beach too. Prices given are indicative. 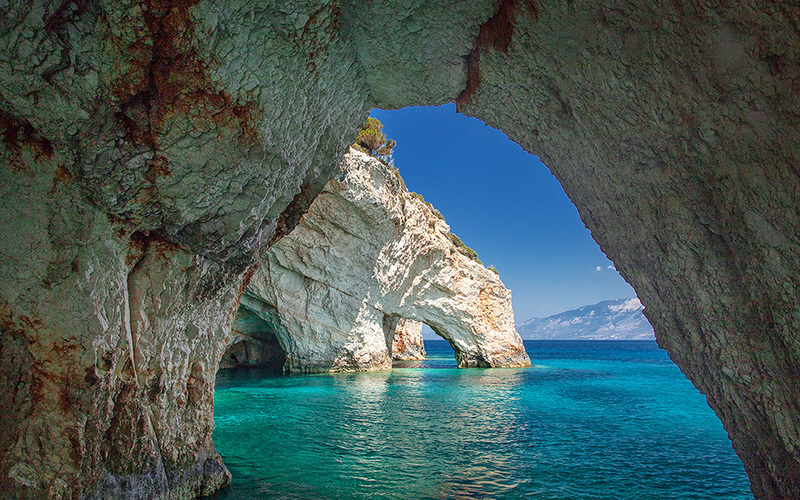 The coastline of Alonnisos is wild and rocky, featuring many little caves and formations. Located near the island’s marine park at the northeast, between the beaches of Strovili and Lalarias, lies the most famous cave: the Blue Cave. It is a white triangular limestone cave, framing the dazzling blue waters, the colors of which shift into an endless spectrum of shades as the sun moves across the sky. Pause for a swim and enjoy waters so clear you can see right to the bottom. One of the biggest advantages, not just of this enchanting little cave but of Alonnisos in general, is that it remains a relatively unknown destination for tourists. This means that –unlike the case for most other blue caves in Greece – you’re likely able to appreciate it in the company of very few visitors. Boat excursions depart from the port of Patitiri at around 10 am, and take you to the marine park as well as the Blue Caves. The price is around €35 per person. There is also the possibility of visiting via kayak ‒ check with tour operators for reliable guides offering this option. Prices given are indicative.